Main Product | Daido Sittipol Co., Ltd.
Motorcyclists Love It! World-class products. 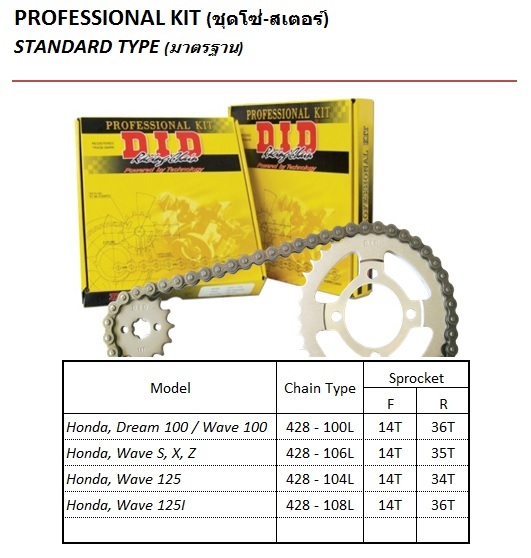 D.I.D drive chains, recognized across the world, have joined hands and put together genuine of the Japanese standards with world famous D.I.D drive chains into “Drive chain and Sprocket kit World Professional Power Kit “. Motorcyclists can now enjoy the international quality products. 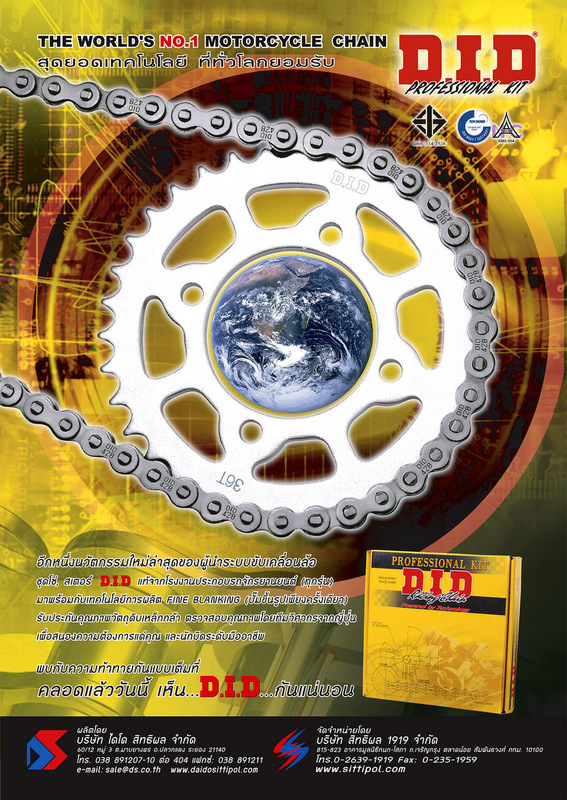 Drive chains and Engine timing chains for motorcycles and automotives have made remarkable advances due to the advanced technology required by Japan’s motorcycle and automotives industries. For this industry we has produced high production technology and quality control systems based on our unique development skills, globally competitive technology and know-how. Engine chains Engine mechanism chains such as timing chains for driving cam shafts on 4-cycle engines used in motorcycles and motor vehicles, chains for driving oil pumps and auxiliaries of generators, etc., and chains for driving balancer shafts meet advanced engineering demand in the automobile industry. The D.I.D engine mechanism chains have excellent wear resistance, fatigue strength, silencing effect and shock strength capable of withstanding high speed operation, and can meet the conditions required for today’s powerful miniature high performance engines. Stand (Bush Type) D.I.D cam chains have made a direct contribution to the development of the OHC engine. Because of their excellent wear resistance and smooth power transmission at low noise levels even under high rotational speed. Special Chain (Silent Type) Having grown with the development of the automobile industry, D.I.D special chain is silent, Excellent in wear resistance, and durable against impact. Particularly impressive is a new 6.35mm pitch Silent Chain for engine which uses Daido Kogyo’s special surface treated SDH and SV processes. This product exceeds the requirements for today’s smaller, high output, high performance engines. Silent chain uses round pins and special plates to achieve an ideal engagement mechanism, and can keep a noise level lower that conventional roller chains. Drive chains are used under the most severe conditions require superior performance in wear resistance and fatigue strength. 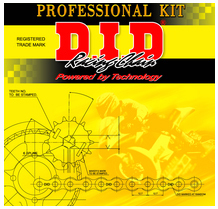 Our D.I.D motorcycle chains can be used safely by any customer because they have been developed from experience acquired world class races like the World Grand Prix, long hour endurance races, motocross and the Dakar Rally. 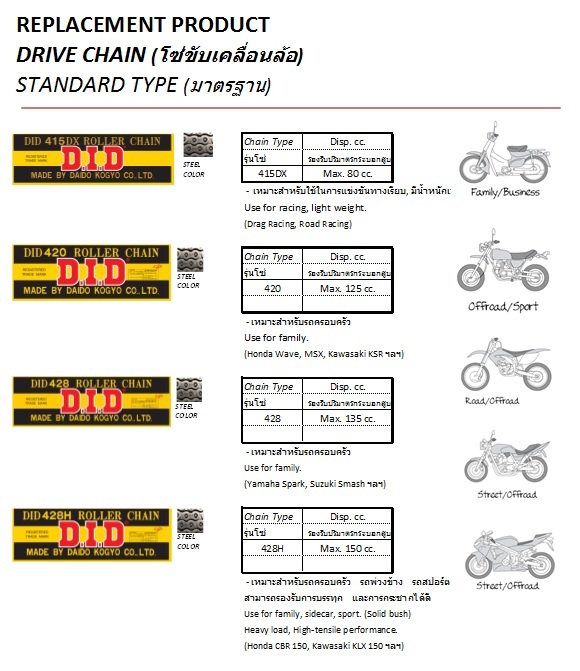 Special Chain (Open Type) Popular-type drive chain which is used under ordinary driving conditions. Made through high-precision automatic production machines under strict quality control, this type of chain is distinguished for its stabilized performance. Special O-Ring Chain (Seal Type) D.I.D O-ring chain is dramatically improved in durability, since grease is sealed between the pins and bushings by O-rings. O-ring chain is very suitable for the following applications. An application which provides a service condition so severe as to cause frequent elongation of chain. An application that precludes lubrication during the service life. An application in an environment with much soil, sand, dust, etc. An application which requires a strength higher than that of sintered bushing roller chain.